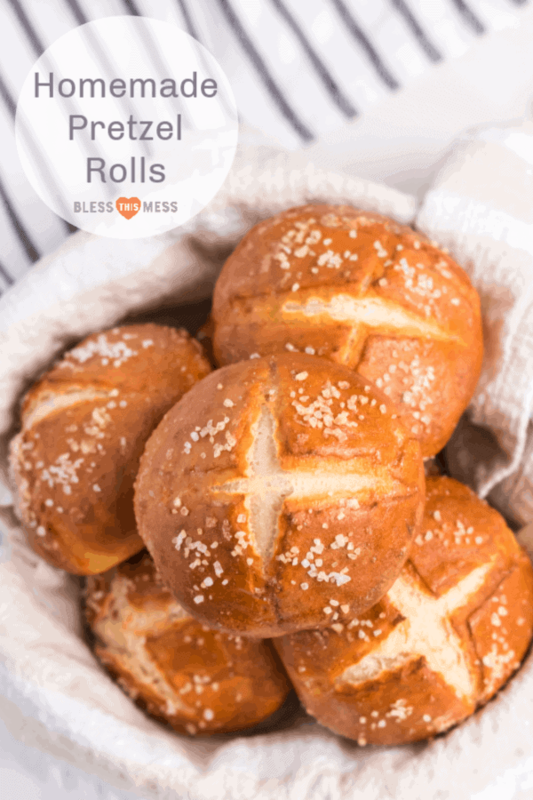 Homemade Pretzel Rolls made with a simple yeast dough that is kneaded, boiled, and baked into soft and extra chewy pretzel rolls. I volunteered to teach a few children’s cooking classes a few summers ago at the community center here in my little town. I was able to bring my kids, the classes were small, and it was something that I really enjoyed. In college, I majored in Recreational Management and Youth Leadership with an emphasis in community recreation – this is right up my alley. We made homemade jumbo soft pretzels. The kids loved making the dough, rolling out the pretzels, and eating them. Since we didn’t have enough time to let the dough rise in class, I made a batch of dough at home, the kids made some dough in class, and then when we were ready to make the pretzels I just had them use the dough I had made earlier. Then the second class used the dough the first class made. In the end I had a batch of dough (made by the second class) left over. I wasn’t in the mood to shape, boil, and bake pretzels, so I just turned them into rolls. They were a fun and easy addition to dinner and the salt on top made them seem a little different from the usual dinner roll. These also made excellent buns for hot sandwiches the next day. So if you’re looking for a little break from the norm, give these a try. Don’t skimp on the kneading time. That long kneading time helps to develop the gluten in the dough which will help give the pretzel rolls that signature soft and chewy middle. Boiling them down is what gives them that distinct dark brown color (in addition to a little egg white wash) and also helps to make the outside extra chewy. It’s what puts the “pretzel” in pretzel rolls! I make pretzels enough that I bought Pretzel Salt, but kosher salt is a great substitute. How do you get salt to stick to soft pretzels? You get the salt to stick to your pretzel by first brushing it with a simple egg white wash and then sprinkling them with salt. The egg whites help the salt to stick and help to make the pretzel brown up nicely while baking. You don’t simply boil pretzels, you boil them in baking soda water! This helps the outside get it’s signature chewy crust, and it also helps the pretzel cook up nice and dark in the oven. 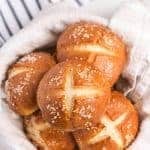 Can I freeze this pretzel roll recipe? Yes, pretzels rolls freeze great. 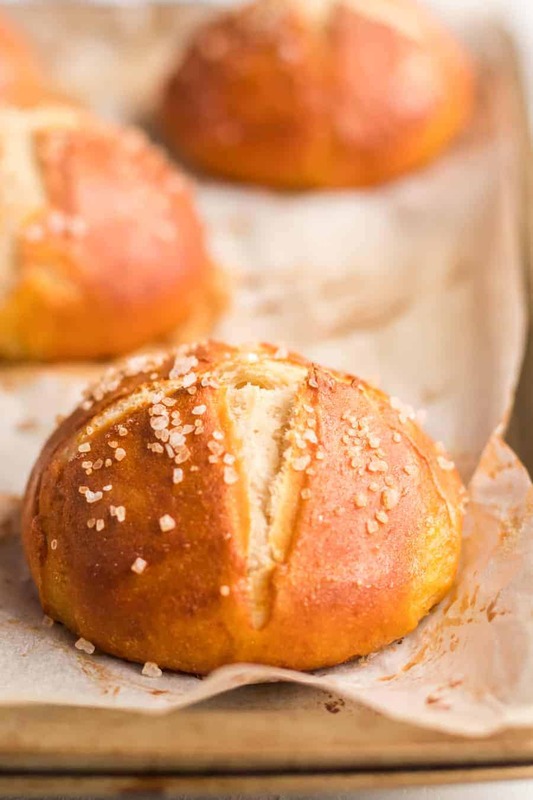 Simply make, bake, and cool your pretzel rolls. Then store them in an air-tight container in the freezer for up to 2 months. 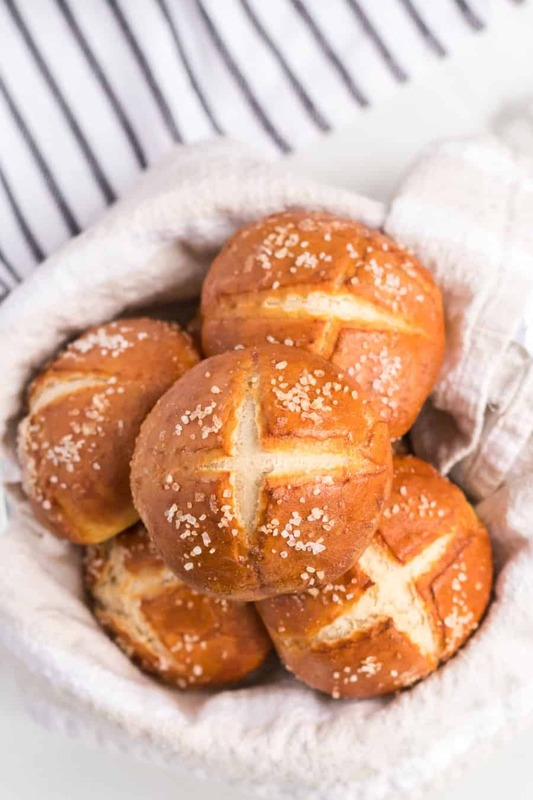 Homemade Pretzel Rolls made with a simple yeast dough that is kneaded, boiled, and then baked into soft and extra chewy pretzel rolls. In a medium mixing bowl (or the bowl to your stand mixer), add the water, yeast, corn syrup, and melted butter. Let the mixture rest for 5 minutes. Add the salt and 3 cups of flour. Stir to combine well. Add the additional flour 1/2 cup at a time until you have added 4 cups total. Use your stand mixer to keep kneading the dough or dump the dough out onto a well-floured surface and knead by hand. Knead for a full 10 minutes. Form the dough into a smooth ball and place it back in the mixing bowl. Cover the bowl with plastic wrap and let the dough rise for 45 minutes. After the dough has risen, dive it into 6-8 pieces. Roll each piece into a smooth ball and place them on a piece of parchment paper or a baking mat, a few inches apart. Cover them with a light dish towel and let them rise for another 45 minutes. After the rolls have risen, bring 4 cups of water and 3 tablespoons of baking soda to a boil in a medium sauce pan. Place the rolls, two at a time, into the boiling water. Let them boil 30 seconds, flip them over, and boil them 30 seconds more on the second side. Remove with a slotted spoon and place on a baking sheet lined with parchment or a baking mat. Cut an X in the top of each roll. Brush each roll with the beaten egg white and then sprinkle with kosher or pretzel salt. 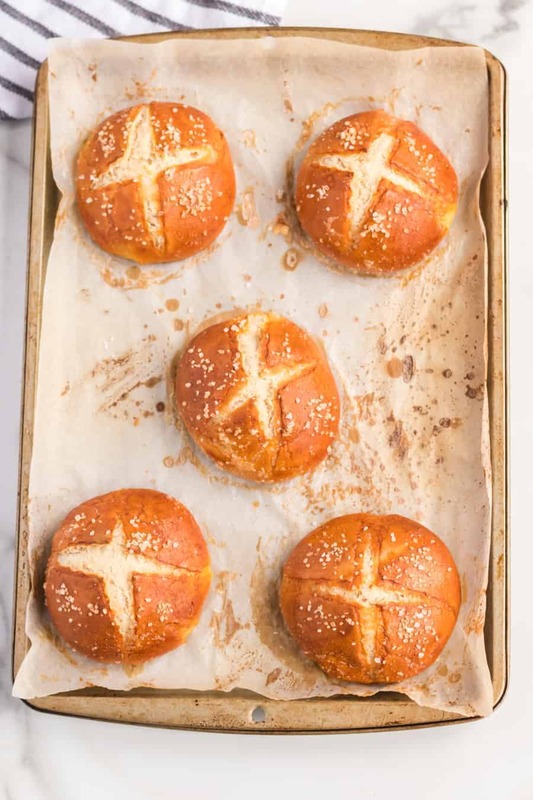 Bake the pretzel rolls for 15 minutes until dark brown. Remove from the oven and eat warm or at room temperature. Store leftovers in an air-tight container on the counter for up to 3 days or in the fridge for up to a week. Boiling the dough is what gives them that distinct dark brown color (in addition to a little egg white wash) and also helps to make the outside extra chewy. It’s what puts the “pretzel” in pretzel rolls! The corn syrup helps to make the bread chewy. If you don’t have any or don’t want to use it, feel free to substitute white sugar or honey. So happy to have updated this recipe from 2012 to share it with you again. It’s a keeper! These look delicious! I am going to make them with dinner tonight. I plan on adding them to my blog (http://raeganmirickfoodblog.blogspot.com/) and of course I will link it back to you! Thanks for a yummy looking recipe.